In November 2016, CEO Dan White published an article exploring how VR changes learning. Fast-forward two years, and it’s obvious that the technology has yet to reach its full potential in classroom and training settings. There have, however, been signs of promise – in the K12 sphere, Oculus recently announced the launch of Oculus Education pilot programs in Taiwan, Japan, and Seattle, while Walmart has decided to level up its employee training regiment by sending virtual reality headsets to every US branch of its stores (totalling more than 17,000 headsets!) It’s an exciting moment for the VR industry – and as developers of digital learning games and simulations, this has us equally excited for the future of VR as a tool for learning. But perhaps no innovation will be more crucial to the future of VR for education than the success of an all-new device announced last week at Oculus Connect 5: the Oculus Quest. Oculus Quest marks a true leap forward for VR, offering users premium, high-fidelity experiences without the need for a PC. That’s right – similarly to the Oculus Go released earlier in 2018 – Oculus Quest is a fully wireless, all-in-one device powering high-quality, Rift-like experiences with inside-out tracking and 6DOF movement. Think of the Quest as a perfect middle ground between traditionally PC-powered VR devices like the Oculus Rift or HTC Vive and portable, all-in-one tech like the Oculus Go or Samsung Gear VR. While there exists a home for all of these devices in the greater VR ecosystem, the Quest represents the ideal balance between horsepower and convenience. Prior to the announcement of the Oculus Quest, premium VR experiences – here I’m referring to graphically-intensive experiences that allow for embodied 6DOF controls – required the VR headset to be connected to a high-powered computer with a dedicated graphics card. Historically, many have pointed to the high cost of entry as a significant barrier preventing VR from becoming mainstream – while the price of a $399 Oculus Rift or $499 HTC Vive may at first appear reasonable, the full cost of admission approaches $1,000+ for those who also need to invest in a beefy PC to operate their headset. Here lies the first key reason why I predict the fully-wireless Oculus Quest will achieve mainstream appeal – by removing the computer from the equation, the entry cost of high fidelity VR experiences is essentially sliced in half. 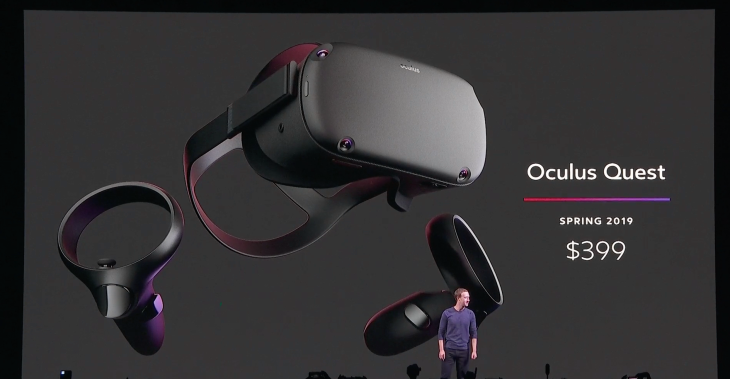 The Oculus Quest is confirmed to retail for $399 – with no additional hardware investment necessary. Furthermore, it is likely that if the Quest achieves commercial success, many existing Oculus Rift experiences will find their way to the Oculus’ new platform, as was the case when Oculus announced their new Go device (many apps previously only available on the Samsung Gear VR were ported to the Go shortly after its release). Until we see other VR heavyweights like HTC announcing a comparable premium all-in-one device, it is likely that many content developers will focus on the Quest as their primary platform for development – resulting in a huge library of high-quality experiences, both old and new. One of the biggest new features of the Oculus Quest is its built in inside-out tracking. In layman’s terms, this means that the device can accurately track one’s hand and body movement without the need for base stations to be positioned throughout their play environment. How will this impact VR for training and education? It’s simple: gone are the days of clearing a dedicated “play area,” positioning and syncing base stations, and being tethered by a wire to a computer. Instead, Oculus Quest just works. Thanks to sweeping innovations in inside-out tracking technology, the Quest device features a number of outward-facing cameras, allowing for the player’s movement and hand positions to be tracked anytime, anywhere. Furthermore, the wireless nature of the Quest makes it incredibly convenient for device management and sharing. For instance, if a school or organization were to order multiple Quest devices, they can be stored and transported in convenient charging carts (similar to existing solutions for Chromebooks and laptops). With the headset(s) not tied down to one powerful PC, they can be easily moved from location to location and shared with multiple different groups. Of course, a VR first-person shooter tech demo likely has no place in your school curriculum or training strategy. However, the concept behind having multiple VR users in a shared virtual environment has incredible implications for the future of collaborative VR learning experiences. Furthermore, I am even more intrigued by the possibilities afforded by having some learners immersed in virtual reality, while others outside of VR participate collaboratively using a complementary smartphone or tablet app (as in the video above). Collaborative learning is a proven way to develop higher level thinking skills, practice oral communication techniques, and reduce overall anxiety around learning – I’ll be fascinated to see the types of multiplayer learning and training experiences released in the future. Despite a small minority of vocal naysayers who claim otherwise, it’s clear that VR is far from dead. Market intelligence firm SuperData predicts the Oculus Go will ship an estimated 1.8 million units by the end of 2018 – supporting the belief that consumers respond positively to affordable, all-in-one VR technologies. With the announcement of the Oculus Quest, the future of VR appears brighter than ever – a promising revelation for longtime believers in virtual and augmented reality for education. Perhaps the classrooms of the future are closer than they appear? Check out the below resources for more on VR for learning, and stay tuned on our blog for the latest updates on our own educational VR projects.